Millions of people spend thousands of dollars on Halloween decorations for their home and yard. For those who already partake in the addition of ghosts, black cats, jack-o-lanterns, witches, and other scary elements in their yards, the anticipation of Halloween lasts all through the year. Halloween yard decorating rivals the excitement felt at Christmas for many, including the candy seeking children. October 31st is the perfect time for diy outdoor halloween decorating when the weather is cool, the colors of nature are changing, and the nights are long and dark. 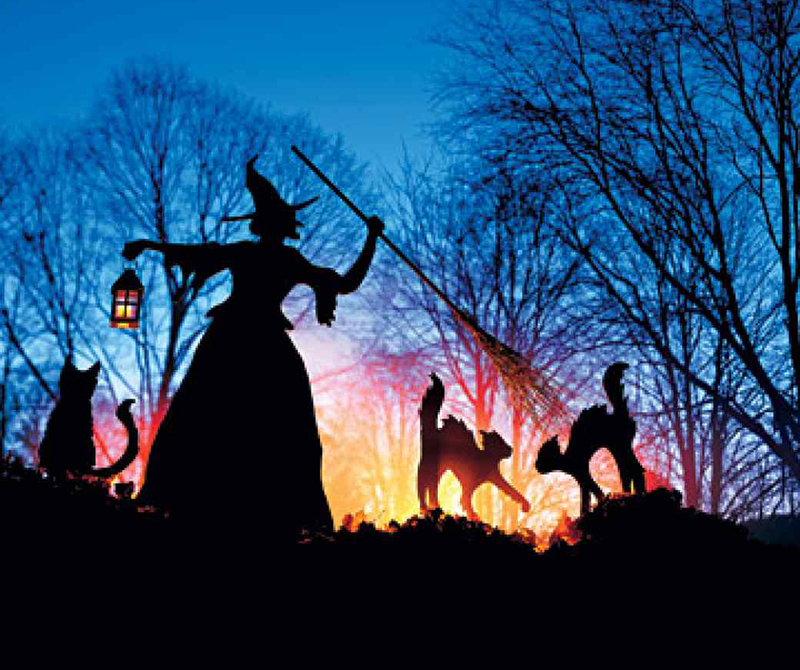 These are the perfect conditions for creating spooky, scary, or whimsical halloween yard decorations for your home and property. It is important to partake in Halloween yard and home decorating to add to the atmosphere and excitement of the holiday. The neighbors will gaze in awe at your unique holiday decor that you create from these spooky halloween decorating ideas. Last updated: 8th September 2018. 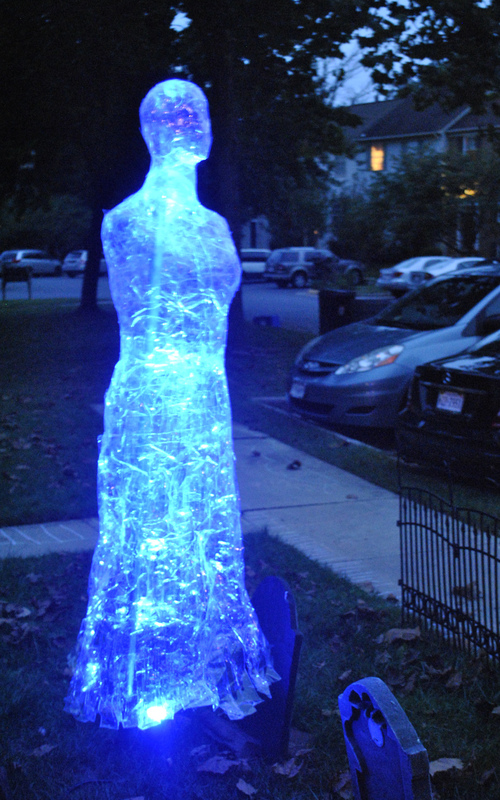 Light up any scary or spooky corner of your yard or home with an assortment of these glowing luminaries that you can construct for only a few dollars or from materials you may already have on hand. 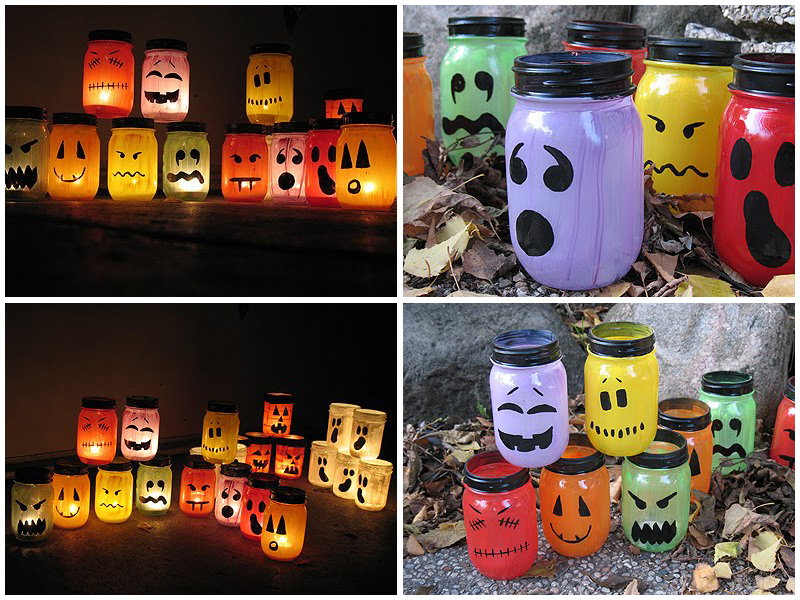 Create an assortment of these glowing ghouls from a few canning jars, some paint, and a candle. Arrange them along a dark path, a set of stairs, or light up a room in your home. These clever lanterns will deliver an ambient glow no matter where you decide to put these fun and easy diy halloween crafts. This is a sweet twist on the classic jack o’ lantern. 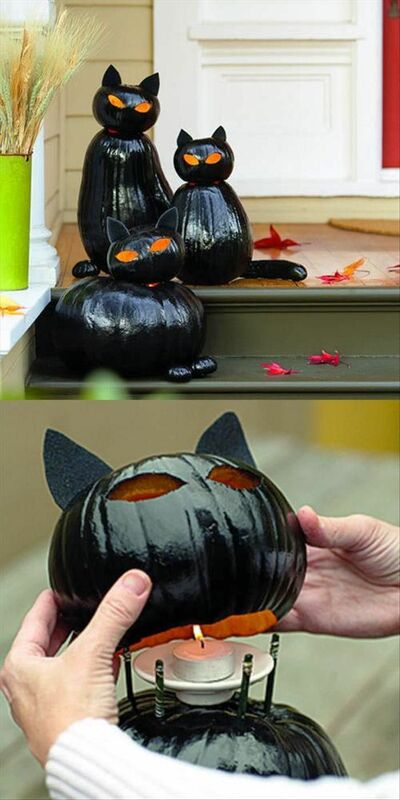 Use spray paint to make the pumpkins black, then stack a smaller pumpkin on top of a larger one to create a black cat. The candle inside the head lights up the eyes, creating an eerie glow. Get creative with your use of pumpkins. Your cats can be short and squat or long and lean. Use smaller pumpkins for feet and painted zucchinis for the tails. If you don’t want to worry about the fire, try using flameless tea lights that mimic the look of real candles. If you’ve got large trees on your property, you’ve undoubtedly spent a lot of time raking up the leaves. Rather than putting those leaves in the garbage or straight to the compost bin, have some fun with them. 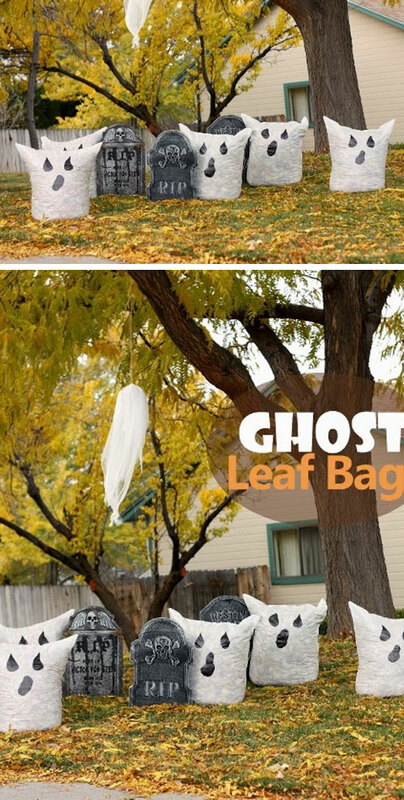 Fully stuffed bags can make some fun looking ghosts scattered throughout the yard. Instead of marking white bags with black eyes for ghosts, you could also fill black garbage bags with leaves and use yellow eyes to make black cats. This could be a great way to encourage your kids to help with the leaf raking. The more leaves they rake, the more ghosts you’ll have for the yard. 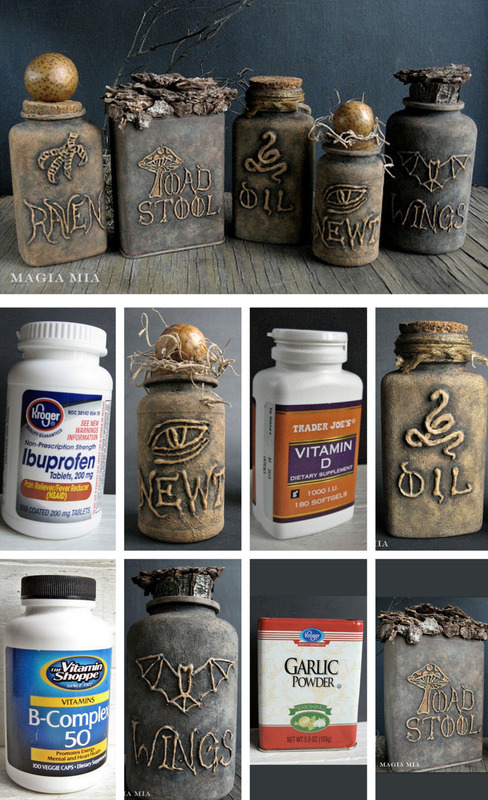 Create these awesome bottles to use as a decoration at your Halloween party. With a bit of creativity, empty pill and spice bottles are transformed into containers for the ingredients that any witch will need for her brews. While the bottles look great on their own, you could also fill them up with real ingredients – perhaps small twigs for raven claws and water beads for the eye of newt. This “potion making” can keep your kids occupied for quite a while. You will have no problem creeping out all of your Halloween visitors with these frightening hanging spider sacks. Who knew that the legs from a pair of white tights, some plastic spiders, and a baseball could create such an unsettling and fantastic visual impact? 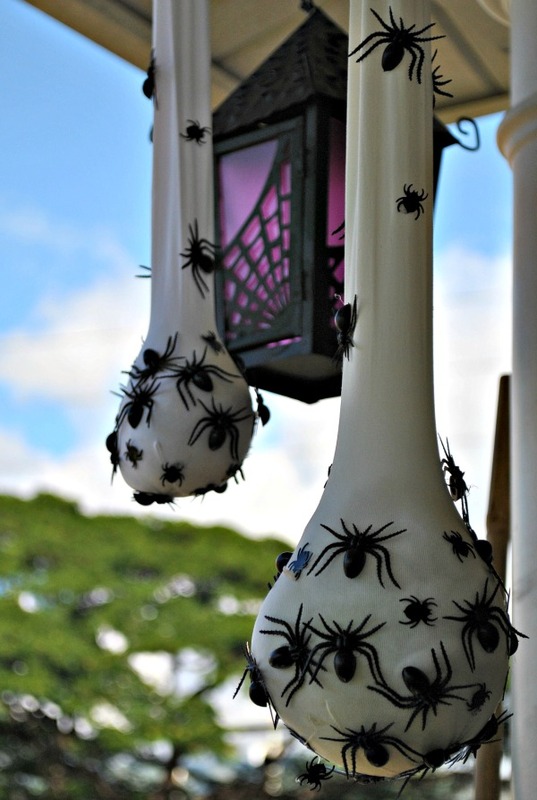 Hang these terrifying yard decorations from trees, porches, overhangs, or along fence lines to create a truly creepy crawly feel to your outdoor decorating. Add them to an illuminated piece of landscaping to creep out the night-time visitors who dare to enter your web of creepy, crawly, and disgusting diy decorations. If you’d like something spooky but a little different from the traditional ghost made from a white sheet, check out how realistic this ghost looks. Made from clear packing tape, it’s cheap and easy to make, though it does take a bit of time. When it’s lit up by a light, though, the effect is stunning. This type of ghost will look great if you’re creating a graveyard scene in your yard, and it could also be fun to have more than one. You might pose ghosts together as a pair of lovers or as a more sinister duo. Create these ominous looking pumpkins with the help of some black spray or acrylic paint to add some additional spooky drama to your diy outdoor halloween decorations. 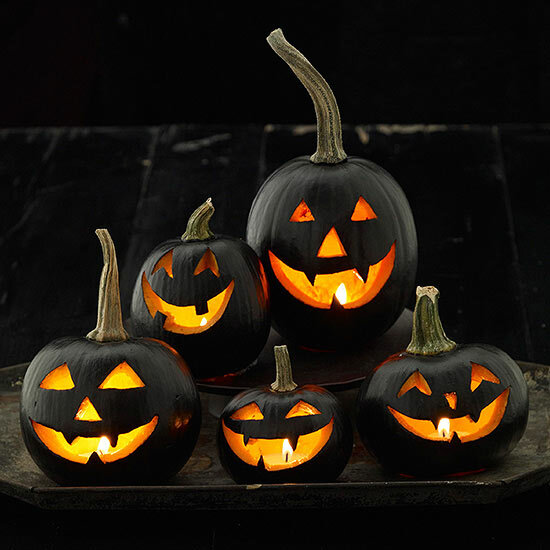 Painters tape will keep the stems of your pumpkins their original shrunken look, while the black paint will lend the perfect background against the lighted inner flesh of your carved pumpkins. Use these pumpkins in your outdoor decorations where the area is the darkest to create a unique illusion from a distance of spooky floating pumpkin faces. 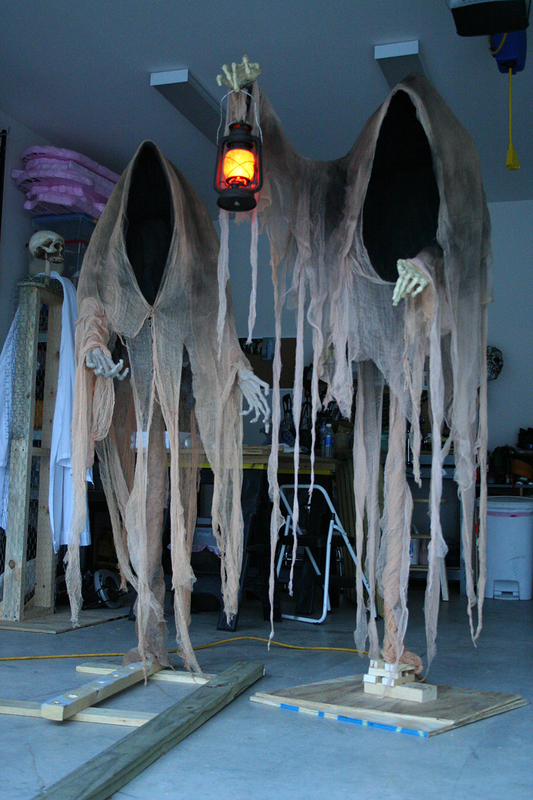 Bring out the eerie in your yard with these easy diy creepy additions. These cool Halloween decorations will take the scary element at your house to a whole new level. Created from pieces of wood, a metal pole, some chicken wire, and a few other elements, this eerie creation will send a chill up your visitor’s spines. This larger than life grim form is great as a greeter at your front door for the Halloween trick-or-treaters or set it off to the side as a menacing onlooker. This ominous Halloween decoration may take a little more time and engineering to construct, but the results are worth the time. There is just something unsettling about the sight of a coffin in outside decorations. 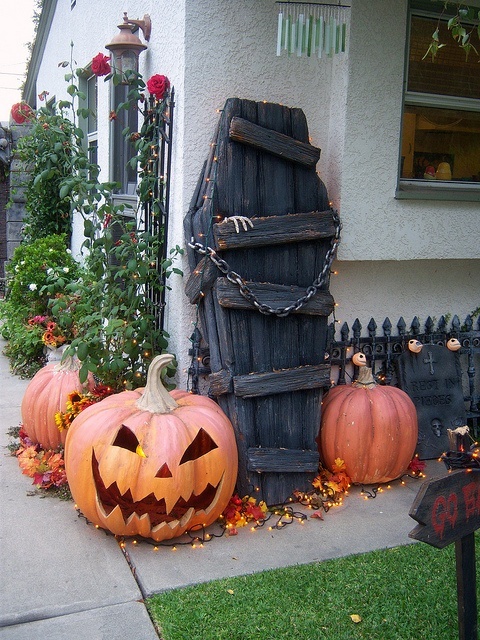 The materials for this awesomely gruesome decoration include pallet boards, orange outdoor Halloween lights, a length of foam or real chain, a rubber hand, and some black paint to create this haunting sight. Lean the coffin up against an outside building or lay it on the ground propped slightly and add some flood lighting for viewing by visitors at night. Wherever you choose to place this DIY Halloween décor, the scare factor will still make your hair stand on end. At first glance, this simple design seems like it could be a good solution for those who want to decorate for Halloween without really going overboard or scaring away all of the neighborhood kids. If you’re familiar with Alfred Hitchcock’s “The Birds,” though, the scene looks a lot more sinister. Best of all, it’s not hard to set up. 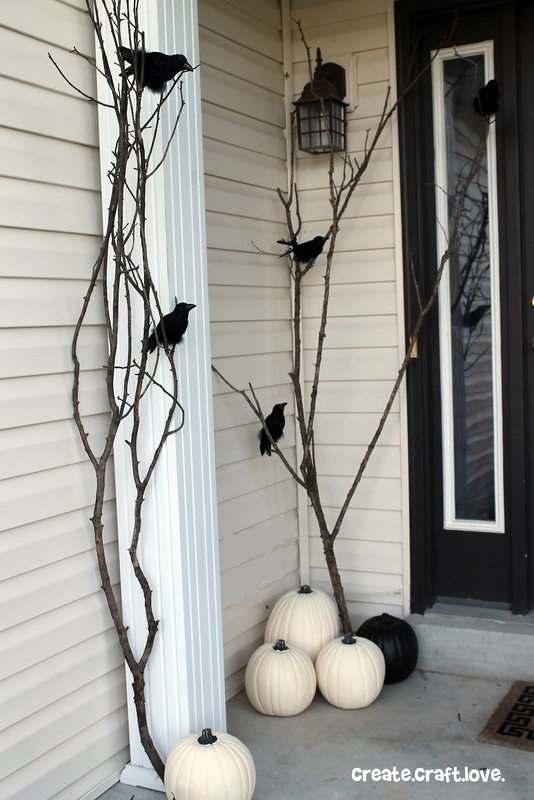 Simply grab a few fallen branches from your yard and attach fake birds to the branches. Painting the pumpkins without carving them gives a distinctly classy look. For safety, though, consider tying the branches to the porch somehow. Otherwise, the sticks could easily catch on a child’s costume and fall on them. Create this ominous scene with a few materials you may have on hand in your garage or storage shed. Some simple wooden cut outs mounted on long metal poles and painted black will give your sunsets an added spooky beauty. Set these silhouettes on the West side of your property to capture the divine sights of the sunset from these outside decorations. Include some ambient backlighting to these outdoor decorations so you can continue to creep your guests out long after the sun has set with this impressive and spooky decorating idea. 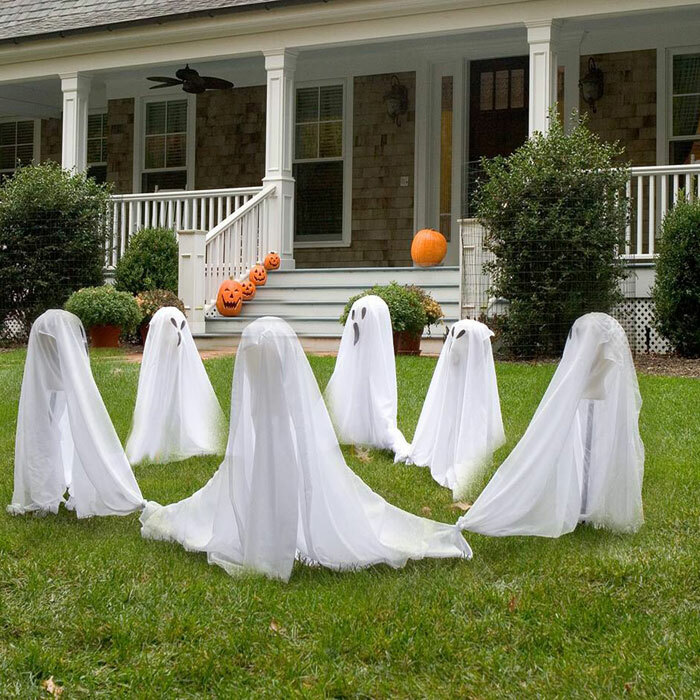 Bring some lightheartedness to your yard when you create this ring of ghosts to add to your halloween house decorations. You can create these cute little playful ghosts from simple materials such as foam mannequin heads, old sheets, metal poles, and a marker. It is as simple as creating a circle of ghosts with the covered poles and tie the edges of the sheets together to form the “holding hands.” In no time at all you will create a group of friendly ghost children “playing” in your yard. These are not the same dolls you are used to playing with when you were a child. This new and extremely creepy version of Barbie is created by painting the dolls with an assortment of colors of paint. Using a clothing dye, color the Barbies clothes a brown muddy color. Spray the dolls with white and gray spray paint to give them their “dead” look. Use paint pens and paint to give the Barbies their freshly fed bloody mouths and dark eyes. When dry, redress your zombie Barbies and arrange them in your outdoor Halloween decoration ideas. This is the perfect idea for those who aren’t satisfied with carving a single pumpkin – completely frame the door with a wide variety of jack o’ lanterns. There’s a trick to this design idea, though. 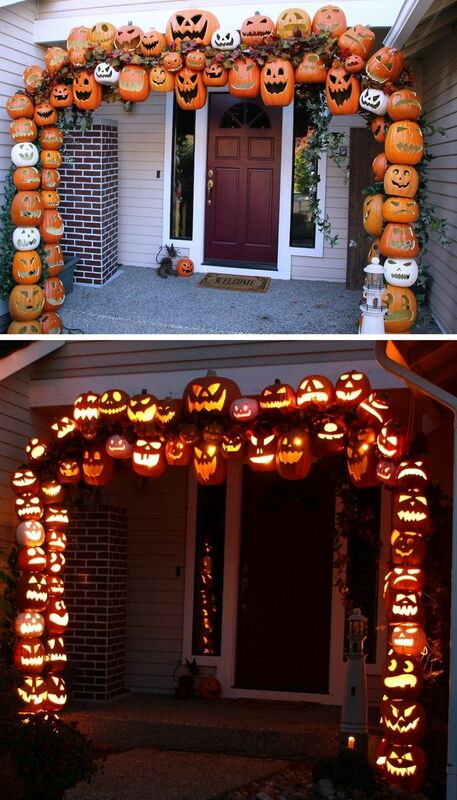 Using real pumpkins would undoubtedly be too heavy and precarious to safely create the arch. Instead, this homeowner used hallow foam pumpkins from the craft store to carve, then attached them to a frame. Since the foam pumpkins are much lighter, you can really pack them in. You’ll also be able to save the decoration for next year. 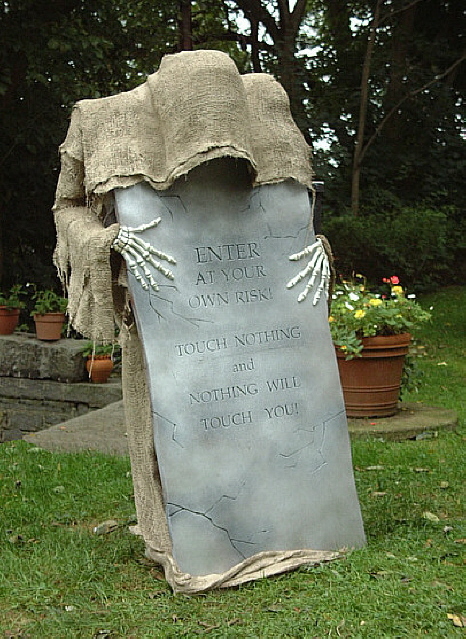 Place this ghoulish warning at the entry to your home to ward off timid visitors. You can create this creepy figure with some burlap, chicken wire, skeleton hands, and a convincing styrofoam “stone” warning. Creative painting and artful shading are the key to the success of this ghoulish and terrifying decoration. This cryptic figure will protect your property from tresspassers with his ominous warning. Trick-or-treaters and onlookers alike will marvel at the bold statement that this ghoul makes in a landscape. Night time up lighting will give this creature a whole new look after the sun has left the sky. 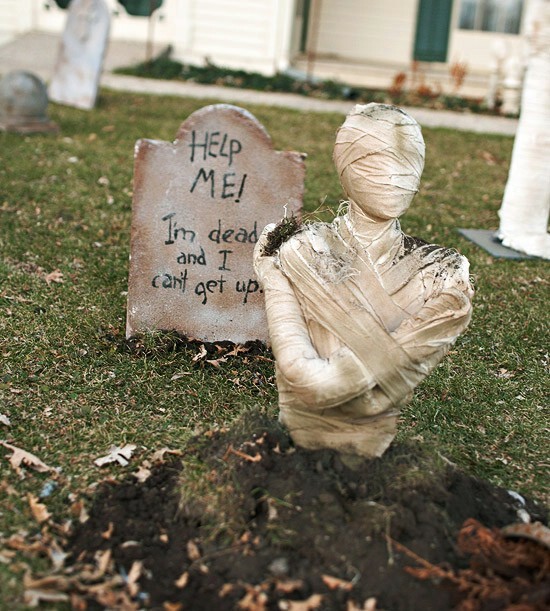 Fill your yard and landscape with these whimsical mummy figures. Easy to create from an assortment of wooden structure pieces, a base, polyester fiberfill, muslin, a dowel, a foam head, and spray paint. This mummified creature is created by constructing a body form from the wood, covering it in batting, and wrapping it in muslin. A few touches of grey, black, and green spray paint will give your fossilized form some color and interest. Create a number of these simple mummies to add interest to many different parts of your outdoor Halloween decorations and landscaping elements.